Although ham gets top billing in the company’s name, Allan Benton and his crew cure and smoke some seriously good bacon. They’ve been at it since 1947, thirty miles south of Knoxville, down near the North Carolina state line. Rubbed with salt and brown sugar, it's set aside to dry cure for a solid month. During that time it loses a good bit of weight but the flavors intensify. Dry curing is an uncommon practice in bacon making, since it takes longer, adds costs and decreases yield. But it creates deep, solid, memorable flavor from a slice that doesn’t shrink much in your skillet. Smoked for three days over hickory and sliced medium, flavor wise it's an intense confluence of smoke, salt and sweet—all at once. None dominates, all are pronounced. Delicious. Incidentally, Allan is one of the kindest, humblest folks I have ever met in the food world. When I visited recently, he confided to me, "I don't know that I've gotten there, but my goal is to make a world-class product." If you ask me, he's there. “The secret is that there is no secret. 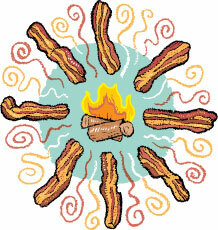 This is the way bacon was made for years. This is the way it was made years ago. Now we're going quicker. But our goal isn't to make it quicker. It's to make the best bacon we can make." "I find myself standing in front of my freezer in the middle of the night, just smelling Allan Benton's bacon through the packaging." "I bought Benton's bacon. My husband cooked it at 4 am. The amazing smell woke me up out of a sound sleep." Benton’s bacon is made in such tiny amounts we regularly sell out of the small amount we can secure. We get shipments regularly, so if it’s sold out, check back soon.